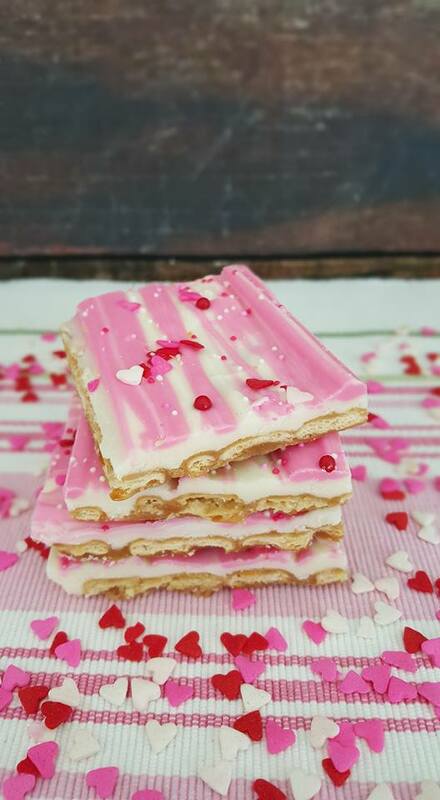 Candy Making doesn’t get much easier than this Valentine’s Crack! 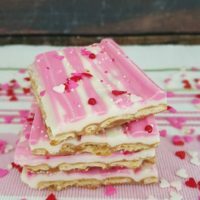 Pink, festive, and the perfect quick and easy dessert to serve up this Valentine’s Day! You might know this as Christmas Crack, but my recipe has a fun spin on it that makes it a creative treat for young and old. I have Christmas Crack a few years back now, and it was love at first bite. That salty and sweet pairing just blew me away! I thought this candy would be complicated to make, but it was beyond simple, and you only need a few basic pantry essentials. Saltines, butter, brown sugar, chocolates and sprinkles is all that is needed for this incredible recipe. If you love sweet and salty, this will win you over. My family just chows down on this snack when I sit it out. What I do is one the Valentine’s Crack is cooled I place in a sealable bag or in an airtight container and keep it on the counter. It stores nicely, and then we can nibble on it here and there when we feel a sweet craving hit. You can keep Valentine’s Crack for around one week in an air tight container or bag. After that it will become stale and need tossed out. 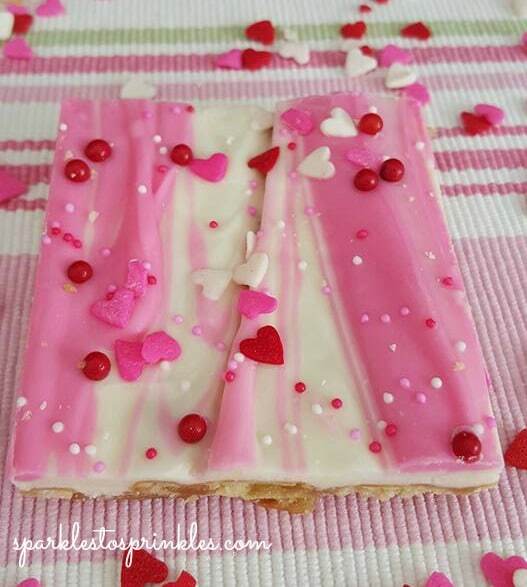 If you have never tried Valentine’s Day crack it is a mix of a toffee with sweet chocolate and in this cake sprinkles to top it off. With the simplicity of saltines, you can really transform the flavor as you pour a caramel style sauce over the crackers and then slather melted butter and then once cooled it breaks into pieces. You can’t freeze the Valentine’s Day Crack. I have found when you go to freeze it, the saltines become mushy when thawed out. Yes! If you want to use say a Townhouse Cracker or even Ritz you can swap. It of course will adjust the flavor slightly but it will work. I have made it with Townhouse crackers and loved the outcome! The beauty of this crack recipe is the versatility that follows. Let me share some variations that you might enjoy. Milk or Dark Chocolate | Skip the white chocolate and reach for milk or dark. 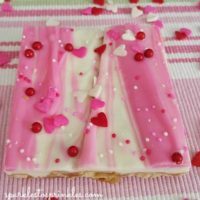 Then take your colored candy melts and drizzle over the top for that pink Valentine theme but with milk or dark chocolate. Graham Crackers | If you want all sweet and skip some of the saltine use graham crackers instead of saltines. It will give you a much sweeter flavor throughout. Candy Toppings | Drop on some colored M&M’s or chocolate shavings instead of the sprinkles if you want. Get playful with yoru toppings. We love adding nuts with the sprinkles. Make sure you check out this delicious Instant Pot Crack Chicken for the perfect entree before your dessert. Give this recipe a try today, and see how you like it. 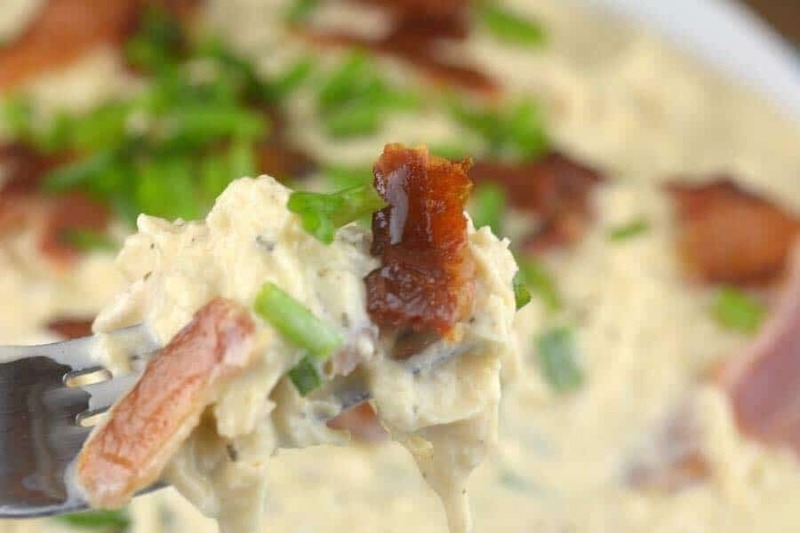 This is a recipe that I think many of you will truly enjoy! Salty, crunchy, and sweet on so many levels! A beautiful version of your grandma's old crack candy recipe. Preheat oven to 325 degrees. Line a large cookie tray with aluminum foil. Spray with cooking spray. Line saltines up neatly in rows. In a medium sized pot melt your butter and brown sugar. Once butter is melted down, bring to a boil. Continue to stir the entire time and boil for about 2 minutes. It will look gorgeous and bubbly. Pour over the top of the saltines. Gently spread across the saltines. Place in oven and bake for about 7 minutes. While your crack is in the oven melt your pink chocolate melts according to package directions. *Please see the body of the post, I have included my no fail chocolate melting tips. 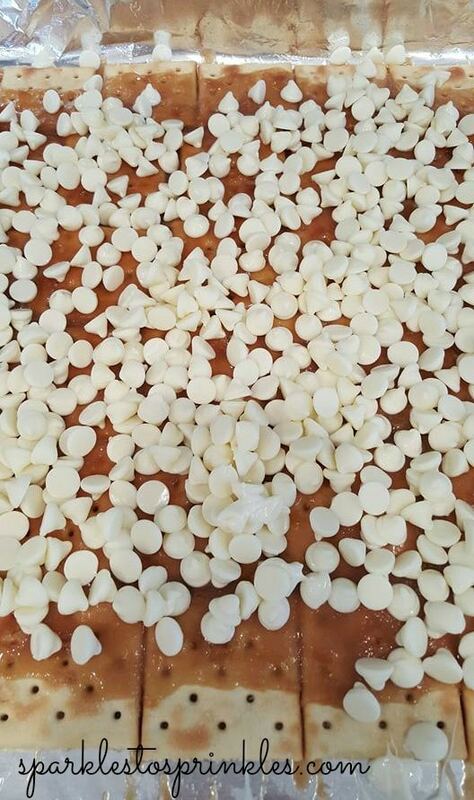 Remove the pan from the oven and than sprinkle your white chocolate chips over the saltines. Your hot toffee mixture will melt the chips. I put mine back in the oven for a minute to move the process along. Once your chips are melting, spread across the top evenly with a spatula. 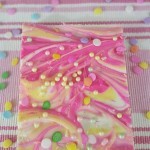 Mix your pink chocolate into the white chocolate by pouring it over the top in a decorative way. I also used a butter knife tip to help combine my colors to my liking. 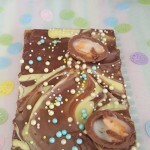 Quickly decorate with sprinkles that tickle your fancy, the melted chocolate will act as your glue. Once chocolate is completely hardened you are ready to serve your LOVES. I thought this was a great idea and can’t wait to make it for my Bingo group next week! Thank you! 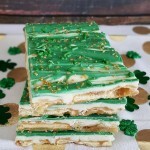 This is perfect – easy to put together and looks just like yours 🙂 Making a second double batch this weekend for both of our co-workers to enjoy!!! What are Pink Chocolate Melts, please? 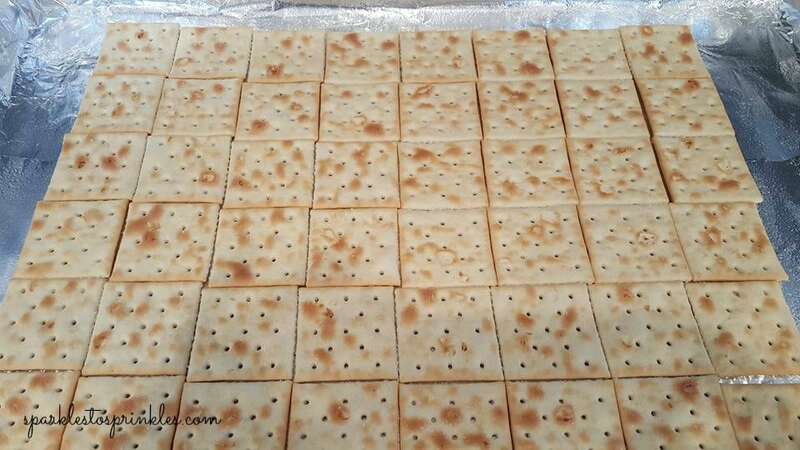 Hi quick question — after they are finished do you cut them into squares or do the break apart into the individual crackers? The exact same thing happened to me. Hershey’s didn’t melt. For batch #2, I melted them in the microwave and poured them over the crackers. Also, I learned not to use generic saltines. There were hardly any whole crackers in my box. Brand crackers are sturdier. I just tried making these and followed the instructions to a T…but the brown sugar/butter part is grainy now that it’s cooled. :(. I don’t understand why. Any suggestions? I am not sure what it could be. BUT I will tell you, it can be a bit tricky to make. I have had days where i just can not get it right at all. Then other days it comes our perfect with no issues at all. I am not sure if the humidity can affect it or what can be the difference sometimes vs other. I really do consider myself an pro at making it now that i have made it soooo many times and yet I have days it just does not come out right! Hello Ladies. I have gotten this a bit “long in the tooth” but I sincerely hope to help. I hope I can help with the chocolate and sugar/butter questions. I have been working with chocolate now for about 25 years. I have used Guittard Chocolates for the most part. I originally started with they’re product named MELT AND MOLD and have been using their Couverture chocolate line almost exclusively for about 2 years. I wanted to use their best chocolate so I hand temper it myself. With that said, I hope to suggest what to do with the problems I have seen while looking at your recipes. Even though you may follow a recipe to a “” T “” so to speak, we all live in many different parts of the country. If it’s raining it will take longer for your sugar to melt into the butter and you should probably let it cook longer ( about 3 to 5 minutes more). Then, if you think it’s done….take some out on the back of a spoon, let it sit for a minute until it cools off a bit then taste it. All Chefs taste their products before they serve it. Just test it with your finger AFTER “at least” A FULL MINUTE before you ever put your tongue to it. You have to make sure all the sugar is completely melted into the butter and by the sound of it…. it hasn’t. Another thing, if you put a top on the pan the humidity now inside the pan will actually clean the sides of the pan by itself from the moisture inside the butter as it evaporates. OR …You may just have sugar built up around the sides of the pot and if you use a silicone brush to “wipe” it down as it cooks that might work too! I remember the first time I tasted this delight. I love that it can be adapted for the season because it should certainly be enjoyed year round. Thanks for sharing with us at Merry Monday. See ya next week. My mother in law loves the usual version of this….she would go nuts for this one! Great idea! Found you on Delicious Dishes Party. you sure can. Just sprinkle them on before the chocolate dries.